It has been ages since doing a Wednesday Wishlist, and I can't think of a more timely one than this one. Transportation is constantly one of the top complaints of living in the San Jose area. We are plagued by levels of traffic that give even LA a run for it's money. We're spending billions on road improvements and public transit, but it does not seem like the net results will ever keep up with the increased demands of a growing population. We live in the innovation capital of the world, there has to be a better way. Elon Musk has recently given a presentation on the first "Loop" tunnel, which is currently being built in the LA area (full video below) by The Boring Company. 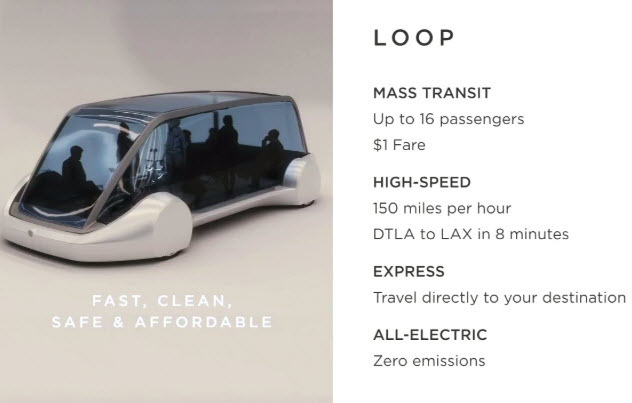 A loop is a lower-cost variant of the Hyperloop proposal a few years back. Stations 1-2 parking spaces wide would allow up to 16 people to enter a pod, which would then descend into a tunnel. The pod would then autonomously travel point-to-point to another station at up to 150 MPH. Rides are targeted to cost $1 per person, less than existing public transit stations. Critical to making this concept successful is reducing the cost of tunneling by a factor of 10 from $1 billion per mile to $100 million per mile. This is possible by using autonomous boring machines with electric motors and batteries (surprisingly the same motors as the Tesla Model 3) that are faster and more efficient than existing machines. Most of the engineers working on the machines are from SpaceX--if anyone can figure it out, it'll be them. After all, they did figure out how to land rockets back on earth on a moving barge. Given that we are at the precipice of next-generation transportation technology, San Jose should be doing everything possible to make sure we're one of the first cities to get access to Loops. Instead of investing in transit systems of the past, we should look to the future. Can you imagine connecting SJC, Diridon Station, and Downtown to every other part of San Jose within a 10min trip? Now's the time to start thinking bigger--or lower--for San Jose. This known as "Personal Rapid Transit", a vaporware concept that has never taken off at a decent scale. Point to point service like this just geometrically does not work. Uber and Lyft are slowly discovering this by creating fixed-route services that ask passengers to walk a bit so the vehicle can stay in a straight line and not deviate to pick up every passenger. VTA does this every day with their buses and trains. Musk's only "innovation' is to suggest putting it in a tunnel. I'd suggest looking at Seattle's wildly successful bus system for a positive example. Bus ridership is up despite trending down in the rest of the US, and Seattle has added thousands of jobs without adding nearly as much traffic. They've committed to providing more frequent bus service and more signal priority and dedicated lanes to bypass traffic. A rocket that can land back on earth in one piece and an electric car that people would actually buy were also vaporware at one point. People said it couldn't be done. All of a sudden traditional auto and rocket companies are spending billions to catch up to the disruptor. This has happened dozens of times in the tech world (great book about it: Innovator's Dilemma). Defending the old way of doing things inspires us to go effectively nowhere. There is no silver bullet and I'm sure this will be an immense challenge, but the point is to try and see if there is a better solution to the problems that plague us all. I respect the ambition of Loops a lot. Even if the idea fails, going electric and autonomous for boring machines could cut the costs of subways significantly, and that would benefit everyone. I think the biggest issues today with Personal Rapid Transit is we're still limited to a 2D plane. That would change with either flying cars or cheap tunnels. One of those will eventually take off, just a matter of when. There was nothing about rockets or electric cars that violated basic geometry the way Personal Rapid Transit does. If Elon Musk does have a way to decrease the cost of tunneling a hundredfold, then let's see it. It would be revolutionary in so many aspects of infrastructure. If not, we have to be careful that throwing all our money and hope in these gadgetbahn ideas will lead us to abandon our public transit system. Remember, in the 1920s, we were all told that automobiles would liberate us and that streetcars are outdated. >Given that we are at the precipice of next-generation transportation technology, San Jose should be doing everything possible to make sure we're one of the first cities to get access to Loops. Instead of investing in transit systems of the past, we should look to the future. Being future looking is good, unless the future technology actually turns out to be a dead-end. Then you have something like BART, which is more expensive to operate than other similar systems because it adopted a future looking rail standard that didn't take off. That is a valid point. However, Silicon Valley exists because we were willing to take risks on what we thought the future would look like. We don't have to put all our eggs in one basket, but should take some bets on future tech along with a willingness to cut our losses if something isn't working out (BART would have been way more cost effective today if it switched to standard gauge tracks). The same level of mobility could be achieved with bus lanes for 0.001% of the cost if the political will was there. The problem isn't that we aren't spending money on transportation, it's that we aren't spending it wisely.